Yes! Cancel your Botox appointment and call your Hair Colorists. No matter your hair color blonde, brown, red, or gray you and your hair will look older if it lacks dimension. The goal is to bring out your youthful glow by infusing warmth an softness into your hair. Tones like caramel, honey, gold, copper, and strawberry give a healthy brightness that makes you look and feel younger. Framing your face with lighter shades draws the eye away from any complexion issues or concerns. Switching your hair color is never as simple as pointing at a model in a picture. The perfect hair color with the right tones will not only compliment your skin but make your best features shine. I have clients on a daily basis request a hair color they have seen on a model or actress and they want nothing short of that color. “The obstacle is not in coloring their hair, it is in understanding whether or not the color is going to match their skin tone and make their complexion fabulous.” Here is a fun fact - cool toned skin has pink, red, and blue undertones, while warm- toned skin has yellow, peach, and golden undertones. So if you are wondering what your undertone is all you have to do is flip your wrist over and look at your veins. If your veins are the color blue or purple, you are most likely cool-toned. If your veins are green and yellow you are most likely warm-toned. So when searching for your dream hair color. “My advice is to add a color that will empower you and boost your complexion.” So make sure to take in account your skin tone, color theory and science. You will see by adding dimension with the right color tone will make you look years younger in an instant. For olive skin I suggest staying in the brunette family . A deliciously rich way to add warmth and softness to facial features. Caramel is guaranteed to make any brunette look fresh and vibrant. If your wanting a darker hue? Warmer blacks like mocha, can help cancel out underlining pinkish tones and really smooth the appearance of the skin. If you have fair skin with warm undertones, see your skin transform. Blondes with wonderful hints of strawberry, caramel, and butterscotch will be amazed with the results. Redheads who add copper, rust and golden blonde are beautifully complimented and are striking. For a medium complexion you are not limited. You can do almost any color, just don’t go overboard! Brunettes should stay with a natural medium to light brown tone. 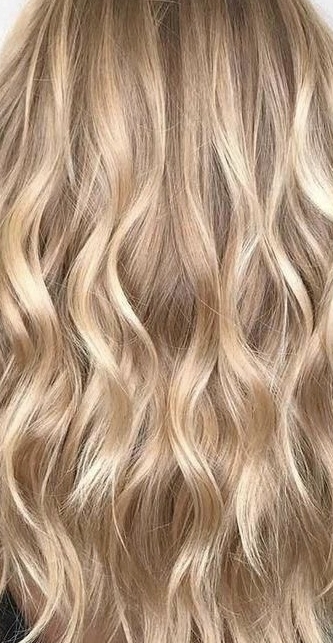 Blondes by Adding warmth, wheat or sand tones to you hair will give your complexion a youthful glow, more shine, and your hair will have incredible dimension.